If you have even the faintest strain of geek in your past, then you’ve probably been party to the movie camp-out experience at least once in your life. 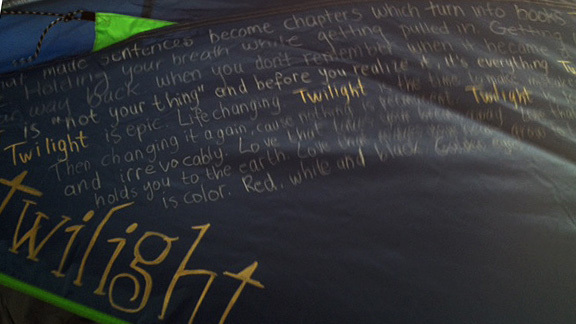 You probably think you know what something called “Twilight Tent City” entails. 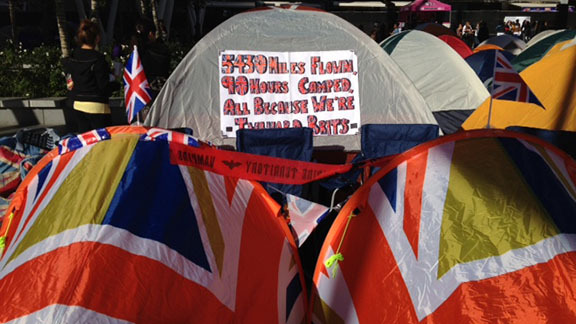 You may even think that “Tent City” sounds a little dramatic for what is probably just a bunch of hygiene-averse, Snuggie-clad fangirls sitting on a sidewalk somewhere in tailgate chairs, living on Cheetos and granola bars for 48 hours. And the denizens of Twilight Tent City would laugh in your face at how greatly you underestimate them. This isn’t just any ragtag horde of fans. 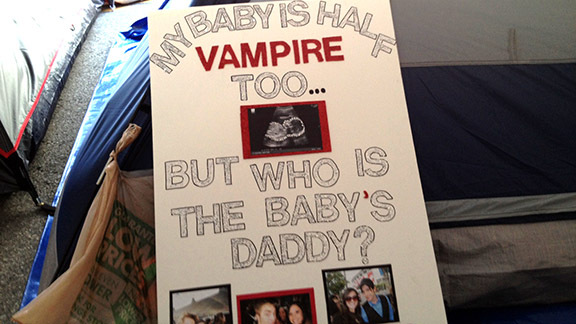 These are over 2,000 highly organized delegates from all corners of the world who have descended on Staples Center’s front lawn for four days of camaraderie and sparkly passion leading up to the red-carpet premiere of The Twilight Saga: Breaking Dawn, Part 2. There was online registration. There’s a press table. There’s group exercise provided by Jamba Juice in the morning. A representative from Summit Entertainment (the films’ distributor, and the organizers of this annual love-in) takes me on a tour of the encampment, which fills the main plaza of L.A. Live and extends for a full block down Chick Hearn Court, covered by a huge plastic canopy that spans the width of the street. 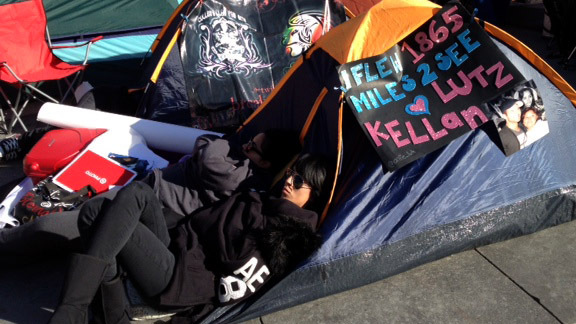 Like any contemporary fan community, 90 percent of the Twihards’ activities take place online, so Tent City is one of the rare opportunities to see and be seen by their brothers (OK, mostly sisters) in arms. But since Breaking Dawn Part 2 is the last Twilight film, this is also the last Tent City, easily the biggest in a series of gatherings that have increased exponentially in scale every year. There’s a bittersweet mood in the air, but also a distinct “go big or go home” mentality. Naturally, making an impression, and (most important) representing your #Team, is crucial. 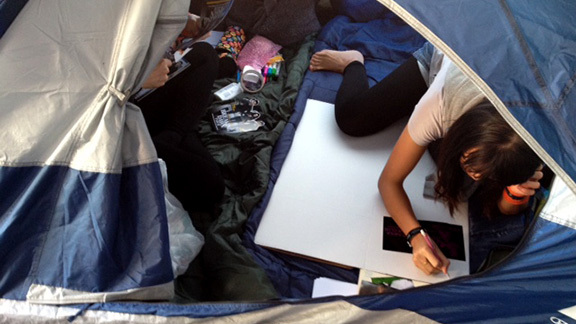 Laura is attempting to cover her tent with writing while fighting the unusually cold wind that is whipping through the encampment. It’s a transcription from a postcard she had made for another fan gathering, which she gives me a copy of. Twilight is the word that made sentences turn into chapters which turn into books. Twilight is “not your thing” and before you realize it, it’s everything. Twilight is epic. Life changing. 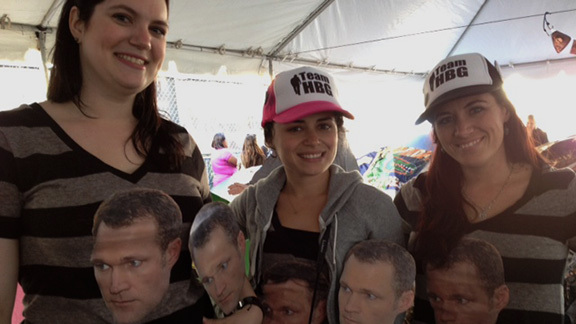 It’s hard repping Team Lutz at Twihard Tent City. Wake this girl up when someone starts an Immortals fan con. As for expenses not covered by Panasonic, Team HBG has still made quite an investment. Lynsey guesses she’s spent $1,500 on travel expenses and camping supplies alone. I know it’s hard to make out in this picture, but the proprietor of this residence has displayed pictures of herself with several male cast members of the Twilight movies, along with an ultrasound image of a sparkly fetus and an inquiry into the child’s paternity. Just want to make sure that’s absolutely clear. Brianne and her friends have made the pilgrimage from Pensacola, Florida — and even temporarily closed the coin shop they run together in order to do so — but so far the decision has paid off. “A guy from [On Air With] Ryan Seacrest came through this morning to talk to people from Tent City, and Ryan talked to my girlfriend, and she was telling him that the two of us — well, all four of us — closed our store for 10 days to come here,” says Brianne. “And he got a kick out of it.” Seacrest offered her and Brianne tickets to the premiere — apparently her mother and the rest of Team Pensacola will just have to make do with the iPhoto slideshow. Brianne says she’s tried to keep the big news on the down-low, but word travels fast in Tent City. She hopes to find some time to sneak out and go dress shopping before Monday. 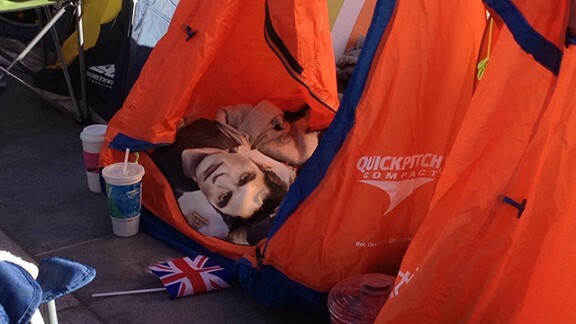 my friend here has the Team Alice tent, my friend here is Team Edward all the way. 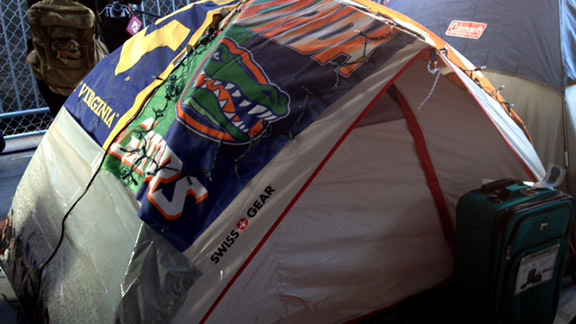 And Mom and her friend Pat, they have the Gator tent.” She points to a tent tucked behind the Lutz, practically hidden from passersby. “College teams in the back,” says Mom, slightly wearily. Everyone laughs.